Nasal anesthesia is required for the management of common routine and emergency procedures. These include nasal examination, nasotracheal intubation, management of nasal and facial trauma, increasingly common office-based sinonasal procedures, and management of facial and nasal abscesses. General anesthesia may not be an option because of the emergent need for intervention, medical risk factors, or operating room availability. Depending on the indication, satisfactory nasal anesthesia may be obtained by the use of topical sprays and pledgets, local injections, regional nerve blocks, or a combination of these. A comprehensive knowledge of the medications, techniques, and anatomy is the key to providing safe, timely, affordable, and effective local anesthesia. The understanding of nasal innervation can be simplified by dividing it into the internal (mucosal) and external (skin) aspects of the nose. The external nose is innervated by the ophthalmic (V1) and maxillary (V2) nerves, which are the first 2 divisions of the trigeminal nerve (cranial nerve V). The superior aspect of the nose, including the tip, is supplied by the infratrochlear nerve (V1), the supratrochlear nerve (V1), and the external nasal branch of the anterior ethmoid nerve (V1). 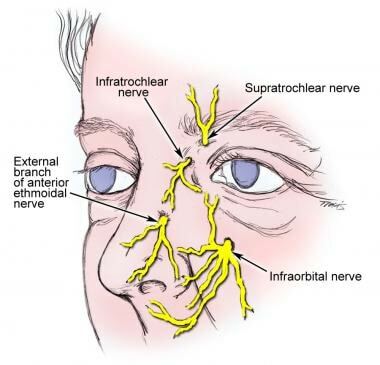 The infraorbital nerve (V2) supplies the inferior and lateral aspects of the nose, extending to the lower eyelids. See the image below. Innervation of the external nose. The internal nasal cavity may be subdivided into the nasal septum, the lateral walls, and the cribriform plate. The superior inner aspect of the lateral nasal wall is supplied by the anterior and posterior ethmoid nerves (V1). The sphenopalatine ganglion (V2) is located at the posterior end of the middle turbinate and innervates the posterior nasal cavity. 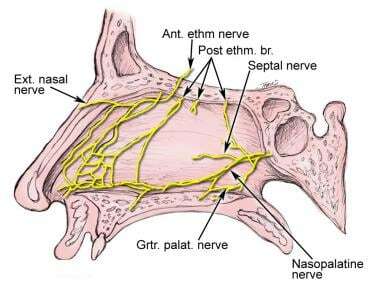 The anterior and posterior ethmoid nerves (V1) and the sphenopalatine ganglion (through the nasopalatine nerve) provide sensation to most of the septum. The cribriform plate holds the special sensory branches of the olfactory nerve (cranial nerve I). See the image below. Innervation of the nasal cavity. For a more complete discussion of nasal anatomy, see Nose Anatomy. Use of internal swabs or pledgets soaked in vasoconstrictors is contraindicated in patients with uncontrolled hypertension or coronary artery disease. Uncooperative or pediatric patients may not be able to undergo anesthesia to the nose. Patients must not be administered an anesthetic agent to which they are allergic. Local infiltration or infraorbital block is contraindicated in the presence of infected tissue. The extent of anesthesia required depends on the procedure to be performed. Nasal anesthetic block is most commonly obtained by a combination of topical and infiltration techniques. First, topical agents may be sprayed, followed by placement into the nasal cavity of cotton pledgets soaked in topical agents. Such pledgets anesthetize branches of the anterior and posterior ethmoid, sphenopalatine, and nasopalatine nerves. The pledgets are removed after 5-10 minutes, and a solution of 1% lidocaine with 1:100,000 epinephrine may be injected along the nasal septum, lateral walls, and floor depending on the target area. If needed, the external nose is anesthetized by blocking the external nasal branch of the anterior ethmoid nerve, the infraorbital nerve, and the nasopalatine nerves. To reduce discomfort while performing a nasal block, several modifications can be employed. Some physicians buffer the lidocaine with 7.5% sodium bicarbonate solution to lower the pH, thereby reducing the burning sensation associated with the acidic anesthetic preparation. Infiltration should be done slowly at low pressure, using a thin needle (27 gauge or smaller). In addition to topical or infiltrative anesthesia, intravenous sedation may be required for children or any patient who is unable to cooperate. Patients who require deep sedation or have complex medical issues are best treated in the operating room in the presence of an anesthesiologist. A seated position is ideal for most patients. A supine position is acceptable for patients who cannot sit upright. Nasal endoscopy is generally performed under moderate sedation with some local anesthesia to the internal nose and oropharynx. The use of a decongestant spray (eg, oxymetazoline) before the topical anesthetic spray reduces its systemic absorption and reduces bleeding during the procedure. Next, lidocaine or tetracaine with or without a decongestant may be topically sprayed. Anesthetic agents are available in different concentrations for topical use (eg, lidocaine, 4%; tetracaine, 2%). The physician must be familiar with the safe dose of any topical preparation used. Many such preparations are available commercially in combination with decongestants. Fiberoptic nasotracheal intubation requires more extensive anesthesia and can be accomplished with a few extra steps. Nasal secretions can hinder both the the absorption of local anesthetic and the view from the fiberoptic scope. The use of antisialagogues are commonly used to address this problem. The drugs most commonly used are glycopyrrolate followed by atropine and scopolamine. Nasal decongestants are then used for the reasons stated above. The most commonly used drug for this is oxymetazoline. Next, topical anesthetics are applied, starting with lidocaine 4% by either topical spray, low-flow nebulizer or viscous preparation. Finally, pledgets soaked in either lidocaine alone or lidocaine with oxymetazoline can be inserted to achieve appropriate anesthesia. Sinonasal procedures may require the above in addition to targeted injections, which can be performed under direct visualization via nasal endoscopy. The lateral nasal wall anterior to the root of the middle turbinate provides anesthesia and vasoconstriction to the anterior ethmoid neurovascular bundle for anterior anatomy. If the posterior ethmoid and sphenoid areas are involved, a sphenopalatine nerve block performed transnasally or transorally is useful as described below. Transoral blocks are especially useful when obstructive disease such as polyps prohibit transnasal access. Transoral anesthesia of the sphenopalatine nerve is obtained via a greater palatine block. The greater palatine foramen is located posterior and 1 cm medial to the second maxillary molar. This depression can typically be palpated prior to injecting. Insert a 25-gauge needle bent at 2.5 cm from the tip of the needle at 45-60° into the area of the greater palatine foramen. See the image below. Transoral block for sphenopalatine artery. The mucosa is first anesthetized, and then advanced through the foramen, which may require slight changes in direction of the needle to palpate and localize it. The needle is then advanced 2.5 cm to its preformed bend. Negative pressure should be applied prior to injection and resistance felt. Aspiration of blood or air signifies entry into a blood vessel or the nasopharynx and requires repositioning. Place the patient in a seated position. Make a pledget by first selecting the appropriate size of cotton gauze, which depends on the size of the patient and the extent of nasal cavity anesthesia desired. 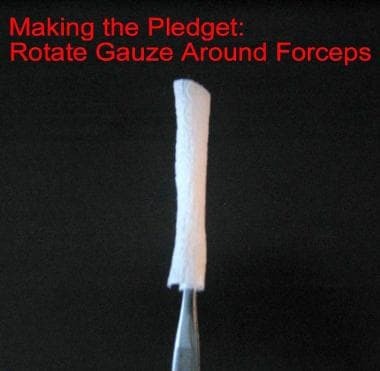 Grasp the cotton gauze in the forceps and rotate it around the forceps until it is rolled into a long cylinder. See the images below. Soak the pledget or cotton swab in the anesthetic agent of choice. Squeeze any excess anesthetic from the swab or pledget. 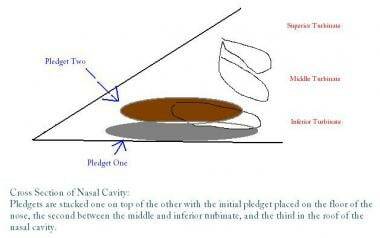 Place the first pledget horizontally on the floor of the nasal cavity. Stack each subsequent pledget on top of the first. Typically, 3 pledgets are needed. See the images below. 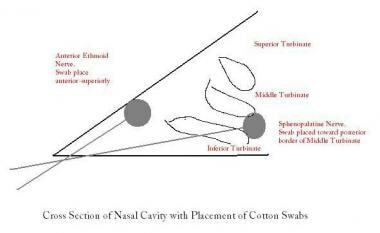 Placement of cotton swabs in the nasal cavity. Placement of pledgets in the nasal cavity. Insert swabs either anterior-superiorly (for blockage of the ethmoidal nerves) or posteriorly along the medial meatus (for blockage of the sphenopalatine nerve). Anesthesia is typically obtained in 5 minutes. If not, the pledgets or swabs can be replaced with new ones. Reduction of nasal fracture or suture of extensive lacerations requires a more complete anesthesia. For a comprehensive nerve block, a series of injections is performed. The practitioner must attempt to limit the number of times the needle is inserted into the skin by performing a series of sequential injections. Block the external nasal nerve with an intercartilaginous injection of the nasal dorsum from the region of the rhinion to the supratip region. Next, block the nasopalatine nerve with an injection at the base of the columella and nasal tip. Inject the other side in a similar fashion. Next, pass the needle through the vestibule into the facial soft tissue to a point just below the mid-orbital rim to anesthetize the infraorbital nerve. Locate the infraorbital foramen on the infraorbital rim. It should be directly below the pupil as the patient stares straight ahead. Palpate the infraorbital foramen from the buccal mucosa of the inner upper lip superior to the ipsilateral first premolar of the desired side. Retract the upper lip with the nondominant thumb, making sure not to occlude the site of the foramen. Insert the needle into the mucolabial fold just anterior to the apex of the first premolar. See the image below. Intraoral approach for infraorbital nerve block. Slowly advance the needle along the axis of the tooth toward the foramen to a depth of approximately 5-10 mm. 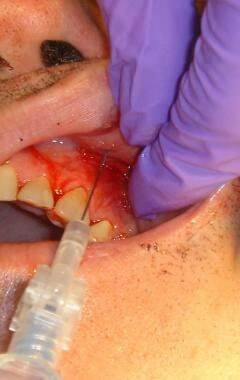 Inject 2-3 mL of anesthetic, making sure not to inject directly into the foramen. Pledgets are preferable to cotton swabs if a large area of anesthetic is required. Pledgets can be purchased in many sizes or can be individually made according to the extent of anesthesia desired and the size of the patient. If the infraorbital foramen cannot be palpated directly from the buccal mucosa, the anesthetic can be injected into the buccal mucosa superior to the first premolar. Injecting directly into the infraorbital foramen can cause permanent damage to the neurovascular bundle. Complications of a local block or infraorbital nerve block can include bleeding, pain at the injection site, deformity of tissues (specific for a local block), infection, needle breakage, and neurapraxia (secondary to injection into the infraorbital foramen). Hornung DE. Nasal anatomy and the sense of smell. Adv Otorhinolaryngol. 2006. 63:1-22. [Medline]. Mondin V, Rinaldo A, Ferlito A. Management of nasal bone fractures. Am J Otolaryngol. 2005 May-Jun. 26(3):181-5. [Medline]. Khwaja S, Pahade AV, Luff D, Green MW, Green KM. Nasal fracture reduction: local versus general anaesthesia. Rhinology. 2007 Mar. 45(1):83-8. [Medline]. Waldron J, Mitchell DB, Ford G. Reduction of fractured nasal bones; local versus general anaesthesia. Clin Otolaryngol Allied Sci. 1989 Aug. 14(4):357-9. [Medline]. Techanivate A, Leelanukrom R, Prapongsena P, Terachinda D. Effectiveness of mouthpiece nebulization and nasal swab stick packing for topical anesthesia in awake fiberoptic nasotracheal intubation. J Med Assoc Thai. 2007 Oct. 90(10):2063-71. [Medline]. Xue FS, Li CW, Liu KP, Sun HT, Zhang GH, Xu YC, et al. Circulatory responses to fiberoptic intubation in anesthetized children: a comparison of oral and nasal routes. Anesth Analg. 2007 Feb. 104(2):283-8. [Medline]. Jonas NE, Visser MF, Oomen A, Albertyn R, van Dijk M, Prescott CA. Is topical local anaesthesia necessary when performing paediatric flexible nasendoscopy? A double-blind randomized controlled trial. Int J Pediatr Otorhinolaryngol. 2007 Nov. 71(11):1687-92. [Medline]. Wang SX, Simpson CB. Anesthesia for office procedures. Otolaryngol Clin North Am. 2013 Feb. 46(1):13-9. [Medline]. Goyal P, Hwang PH. In-office surgical treatment of sinus disease: Office-based surgical procedures in rhinology. Oper Tech Otolaryn. 2006 Mar. 17(1):58-65. Hafner HM, Rocken M, Breuninger H. Epinephrine-supplemented local anesthetics for ear and nose surgery: clinical use without complications in more than 10,000 surgical procedures. J Dtsch Dermatol Ges. 2005 Mar. 3(3):195-9. [Medline]. Rosenberg PH, Veering BT, Urmey WF. Maximum recommended doses of local anesthetics: a multifactorial concept. Reg Anesth Pain Med. 2004 Nov-Dec. 29(6):564-75; discussion 524. [Medline]. Brown RS, Rhodus NL. Epinephrine and local anesthesia revisited. Oral Surg Oral Med Oral Pathol Oral Radiol Endod. 2005 Oct. 100(4):401-8. [Medline]. Ophthalmologic, otolaryngologic and dental procedures. Roberts JR, Hedges JR. Clinical Procedures in Emergency Medicine. 3rd ed. Philadelphia, PA: WB Saunders; 1998. 1135-7. Fulling PD, Roberts JT. Fiberoptic intubation. Int Anesthesiol Clin. 2000. 38(3):189-217. [Medline]. Douglas R, Wormald PJ. Pterygopalatine fossa infiltration through the greater palatine foramen: where to bend the needle. Laryngoscope. 2006 Jul. 116(7):1255-7. [Medline]. Taleghani K, Sternbach G. Infraorbital nerve block. Rosen P, Chan T, Vilke G, Sternbach G, eds. Atlas of Emergency Procedures. St Louis, Mo: Mosby; 2001. 160-1. Kezirian GM, Hill FD, Hill FJ. Peribulbar anesthesia for repair of orbital floor fractures. Ophthalmic Surgery. 1991 Oct. 22(10):601-5. [Full Text]. Simion C, Corcoran J, Iyer A, Suresh S. Postoperative pain control for primary cleft lip repair in infants: is there an advantage in performing peripheral nerve blocks?. Paediatr Anaesth. 2008 Nov. 18(11):1060-5. [Medline]. Infraorbital nerve block: intraoral approach. Roberts and Hedges, eds. Clinical Procedures in Emergency Medicine. 4th ed. Elsevier; 2004. 559-60. Higgins TS, Hwang PH, Kingdom TT, Orlandi RR, Stammberger H, Han JK. Systematic review of topical vasoconstrictors in endoscopic sinus surgery. Laryngoscope. 2011 Feb. 121(2):422-32. [Medline]. Gaviola GC, Chen V, Chia SH. A prospective, randomized, double-blind study comparing the efficacy of topical anesthetics in nasal endoscopy. Laryngoscope. 2013 Apr. 123(4):852-8. [Medline]. Kameyama K, Watanabe S, Kano T, Kusukawa J. Effects of nasal application of an epinephrine and lidocaine mixture on the hemodynamics and nasal mucosa in oral and maxillofacial surgery. J Oral Maxillofac Surg. 2008 Nov. 66(11):2226-32. [Medline]. [Guideline] Neal JM, Bernards CM, Butterworth JF 4th, Di Gregorio G, Drasner K, Hejtmanek MR, et al. ASRA practice advisory on local anesthetic systemic toxicity. Reg Anesth Pain Med. 2010 Mar-Apr. 35(2):152-61. [Medline]. Atighechi S, Baradaranfar MH, Akbari SA. Reduction of nasal bone fractures: a comparative study of general, local, and topical anesthesia techniques. J Craniofac Surg. 2009 Mar. 20(2):382-4. [Medline]. Lavery GG, McCloskey BV. The difficult airway in adult critical care. Crit Care Med. 2008 Jul. 36(7):2163-73. [Medline]. Powell O, Doshi D. Towards evidence based emergency medicine: best BETs from the Manchester Royal Infirmary. BET 4: Should nasal fractures be manipulated under local anaesthesia?. Emerg Med J. 2008 Aug. 25(8):525-7. [Medline]. Takahashi Y, Kakizaki H, Nakano T. Infraorbital foramen: horizontal location in relation to ala nasi. Ophthal Plast Reconstr Surg. 2011 Jul-Aug. 27(4):295-7. [Medline]. Tong JL. Xylometazoline pretreatment reduces nasotracheal intubation-related epistaxis in paediatric dental surgery. Br J Anaesth. 2011 Feb. 106(2):279; author reply 279-80. [Medline]. Michael Lawrence Hochberg is a member of the following medical societies: American College of Emergency Physicians, American Medical Association, and Society for Academic Emergency Medicine.